Background: Type 2 diabetes is a multifactorial disorder influenced by both genetic and environmental factors and is rising dramatically throughout the world. Recently, consideration to dietary acid-base load has been raised as a nutritional indicator that could have metabolic effects. 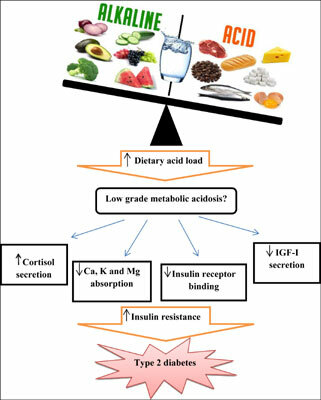 Objective: The aim of this study was to systematically investigate the associations of dietary acid load indices with glucose/insulin homeostasis and type 2 diabetes in a patent based review. Methods: Systematic literature review was conducted using PubMed, Scopus and Google Scholar, from inception up to 10 January 2018. All human studies publications investigated the association of dietary acid load indices (PRAL or NEAP or Pro:K) and incidence of diabetes or glucose/insulin metabolism were included. Results: In all, 174 studies were included for the title and abstract screening. A total of 164 articles were excluded because they did not meet the inclusion criteria. Finally, 10 articles (five crosssectional studies and five cohort studies) in accordance with our inclusion criteria were chosen for further evaluations that were published between 2008 and 2017. Conclusion: Although there are some evidence of an association between dietary acid load and type 2 diabetes, definitive declarations in this regard will be needed to intervention human studies modifying acid-base dietary intake. Diabetes, insulin resistance, dietary acid load, PRAL, NEAP, Pro:K, systematic review.